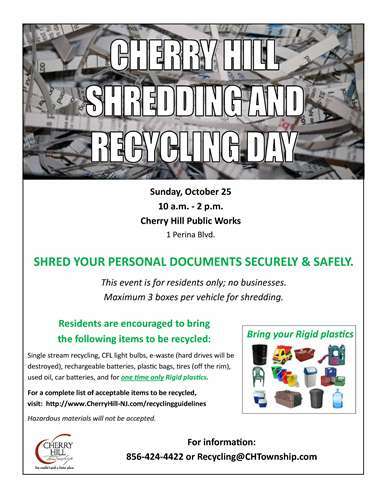 (Cherry Hill, N.J.) – Cherry Hill Township will host a free Shredding and Recycling Day for Township residents, from 10 a.m. to 2 p.m. Sunday, Oct. 25, at the Cherry Hill Public Works Complex, 1 Perina Blvd. The event gives residents a convenient way to securely dispose of personal documents and recycle almost any item at no cost – just in time for fall cleaning season. Items that will be collected include single-stream recycling, CFL light bulbs, electronic waste (hard drives will be destroyed), rechargeable batteries, plastic bags, tires (off the rim), used oil and car batteries. Residents will also have the one-time-only opportunity to recycle “rigid” plastics, including outdoor climbers and other toys, crates, plastic trashcans and buckets, plastic lawn chairs, coolers and pet carriers. Visitors will also receive a few special giveaways, including home insulation kits and 30-gallon paper yard-waste bags. Household hazardous waste will not be accepted at the Oct. 25 event. For more information about hazardous waste recycling, call (856) 858-5241. The Township event is open to residents only; no businesses, please. Limit 3 boxes of shredding material per vehicle. For a complete list of acceptable items to be recycled with your weekly curbside collection, please visit www.CherryHill-NJ.com/recyclingguidelines. For more information, please contact the Department of Public Works at (856) 424-4422, or email recycling@chtownship.com.